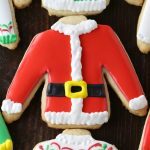 Ugly Sweater Christmas Cut-Out Sugar Cookies – a recipe post by Mom Loves Baking! 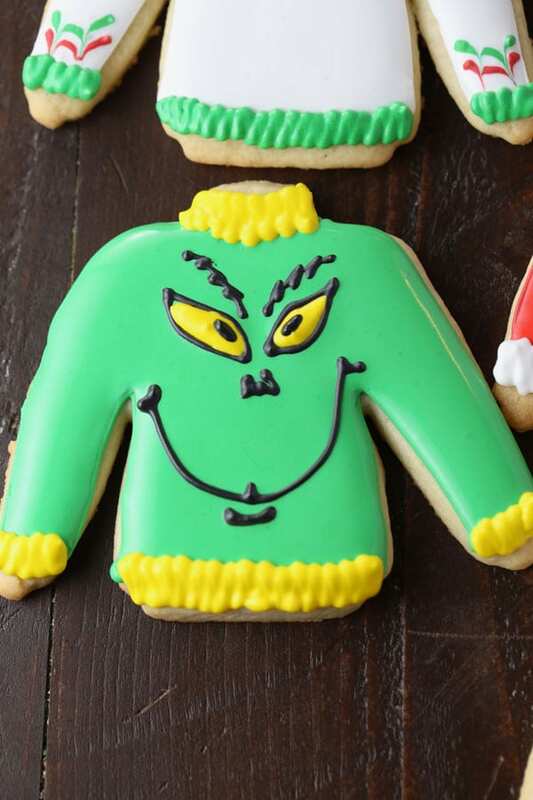 I made these Ugly Sweater Christmas Cut-Out Sugar Cookies for a class I’m teaching next weekend! The sugar cookie recipe is one I’ve been using for many years, so I thought I’d share it with you. I used to have a cake and cookie business about 10 years ago and this was my favorite sugar cookie recipe. They come out perfect every time. The decorations are all done with royal icing. The trick to getting a smooth finish is to use the royal icing in two consistencies. You use a medium consistency (like toothpaste) to make an outline around the outer edge of the cookie, then you fill it in with a thinner consistency (like Elmer’s glue) which is also called “flood” icing. Let it dry for an hour or so. Then decorate with medium consistency frosting. OR if you want to added decorations to the wet “flood” icing, then it will sink in and be flat (see the white sweater with red/green striped design – I did red and green stripes, then dragged a toothpick down through the stripes to create the neat pattern). I used the same technique with the green Christmas tree, let it dry, then piped medium consistency yellow dots and a star. Make sense? It was fun designing these sweaters! 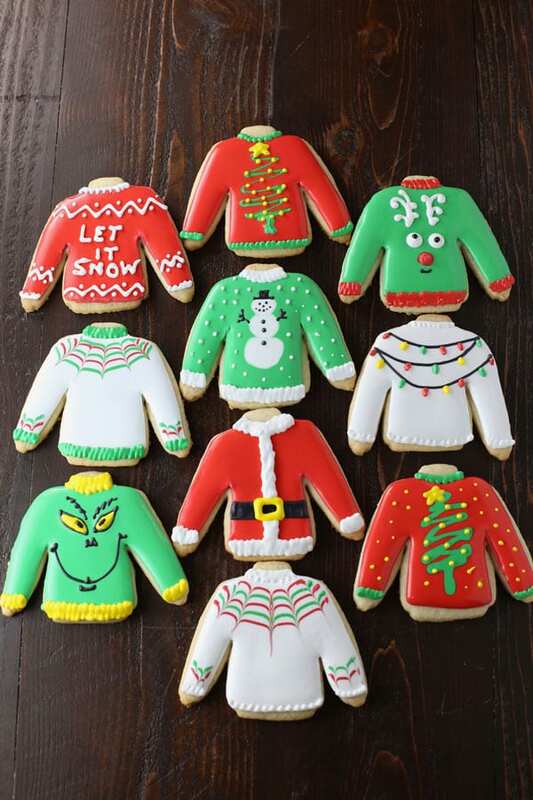 I reviewed tons of ugly sweater cookie photos online to get ideas, then I came up with my own variations. There are so many different tacky sweaters you could do. Make up your own and let your creative juices flow! I tried to keep the colors to a minimum so I wouldn’t have a million piping bags. I simply used white, red, green, yellow and black. I used tipless piping bags for the decorating part and squeeze bottle for the flooding part. 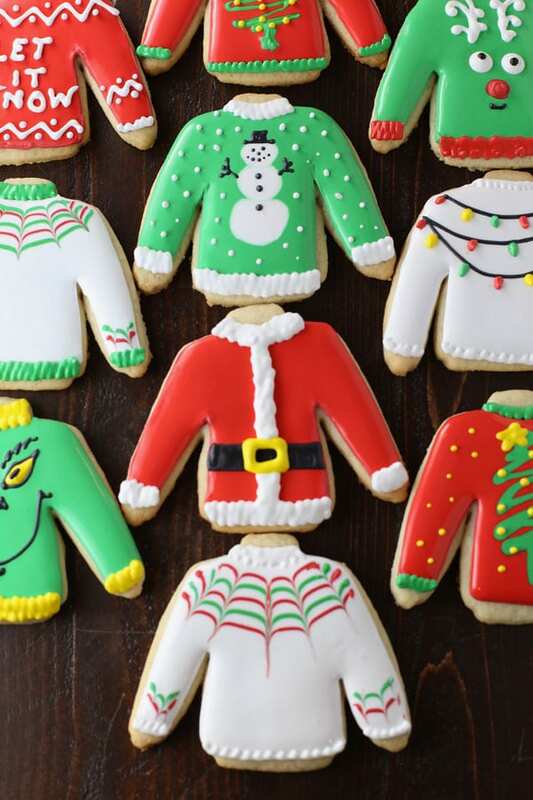 Which Ugly Sweater Christmas Cut-Out Sugar Cookies design is your favorite? 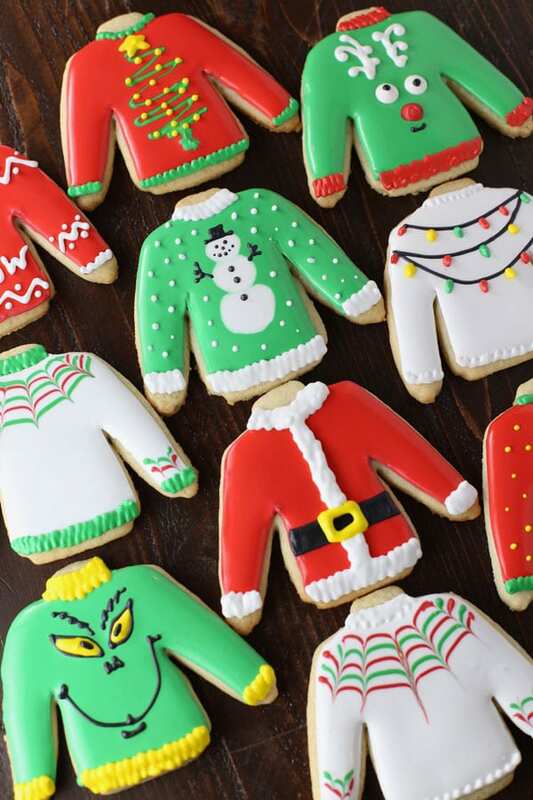 Sugar Cookies with Royal Icing decorated to look like tacky Christmas sweaters! Preheat oven to 350°F. In a medium bowl, add flour, baking powder & salt (measuring the flour with a scale is the most accurate). Using a whisk, stir to combine and get the lumps out. Set aside. In a large bowl, add butter and sugar. Beat with an electric mixer for 3 minutes. Add the egg and vanilla and beat another minute. With the mixer on low, gradually add the flour mixture. Blend until the dough begins to pull away from the sides of the bowl. Take the dough out of the bowl and place on a large piece of parchment paper. Use your hands to knead the dough for a few minutes. Divide the dough into two sections and wrap with parchment paper. Let chill in the refrigerator for about 30 minutes. To roll dough, place another piece of parchment paper on top of dough and roll with a rolling pin until the dough is between 1/8" and 1/4" thick. Cut into shapes and remove the excess dough. Don't move the shapes, leave them where they are and place on a cookie sheet. Bake for 10-13 minutes or until slightly golden brown around the edges. 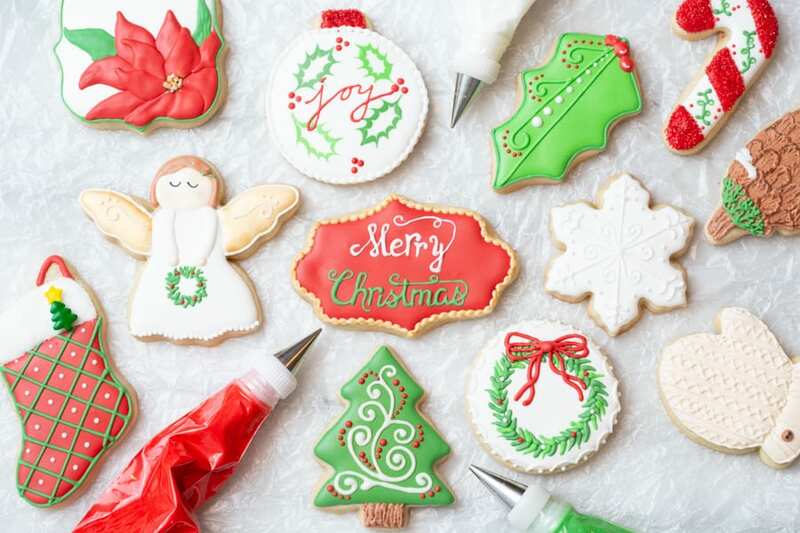 Let them cool and decorate with royal icing (or you can freeze them before decorating and keep them for several months). Makes 20 (3" cookies). Place all ingredients in a large bowl and beat with an electric mixer on low for 6 minutes. It will be very thick and fluffy. Add 4-5 tablespoons of water and mix to combine. That's your medium consistency (it should be like toothpaste). Take half the icing and put in another bowl. Add another 1-2 tablespoons of water to that to make the thinner consistency. It should run off the spoon like Elmer's glue. That is your flood consistency. 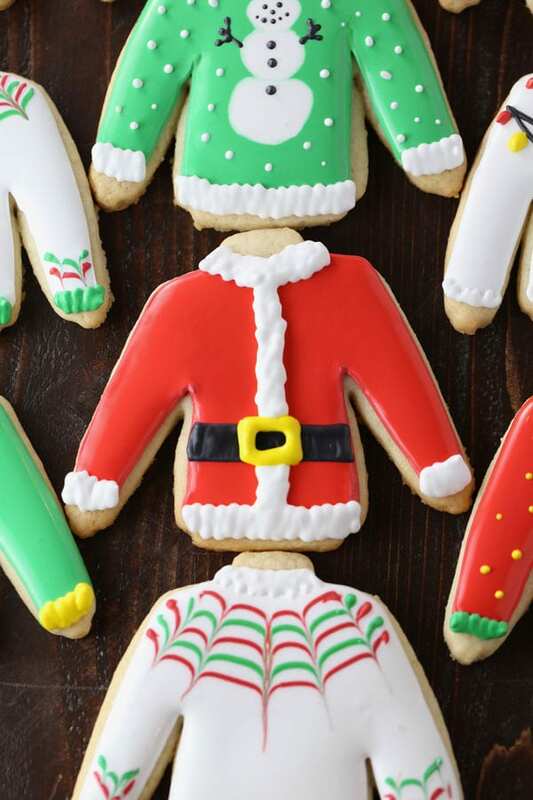 Divide and color as desired to decorate the cookies. Add medium consistency icing to a piping bag, cut a tiny tip off and pipe an outline around the outer edge of the cookies. Then fill in with flood icing. I poured my flood icing into a plastic squeeze bottle to make it easier to distribute. Let dry about an hour, then add decorations with the medium consistency icing. These cookies are featured on Meal Plan Monday!